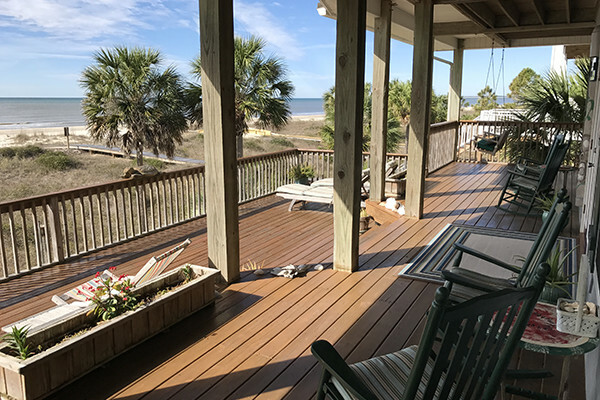 The inn features beautiful Gulf front views from large shaded porches and sundecks furnished with rocking chairs, deck chairs, lounges, and a porch swing. The inn building is on pilings which means the first floor is one flight of stairs up and the second floor is two flights of stairs up. 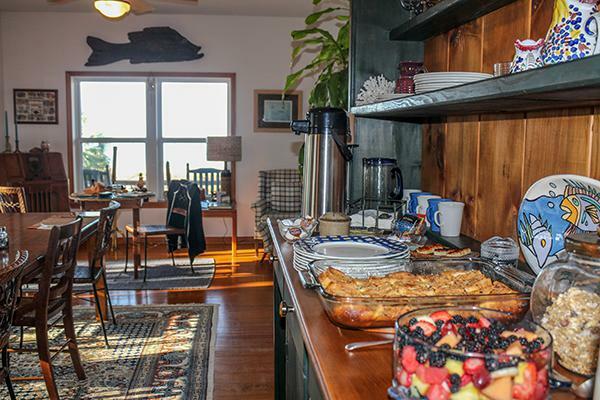 The inn has a screened porch, a guest TV area, ceiling fans, air-conditioning and a beachfront dining room, perfect for dolphin watching at breakfast. 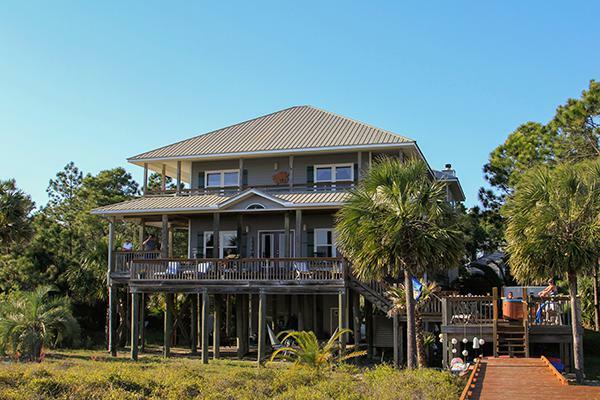 All four guest rooms have private entrances from the decks, private bathrooms, air conditioning, ceiling fans, and a Gulf view. This building is for adults only, and the rates are for 2 guests per room and include a full breakfast each morning in the lobby from 7:30am-10:00am. The building is also equipped with high speed WIFI. In addition to the decks and porches of the B&B building, guests have access to an outdoor shower close to the beach access. Chaise lounge chairs, umbrellas and hammocks are also available for guest use. On the ground level under the Inn is a storage closet with a community refrigerator. There is a two night minimum stay at the Turtle Beach Inn bed & breakfast, and there is a three night minimum for holiday weekends. Only 2 adults per room, and no pets allowed please. Click on the highlighted text below for virtual and photo tours of the main Inn and each guest room. Main Lobby Level: The main lobby area is always open and available for guest use. This area includes the check-in office with area information and breakfast / dining area. Also on this level, the lounge/living area has comfortable seating with satellite TV, an ice machine and adjoining screened porch. Room 1: King bed /Rate: $220 per night/ Max guests: 2 adults. This room is located on the first floor outside of the main lobby and has westerly view of the Gulf. Room 1 has a private entrance, full bathroom, ceiling fan and central heat/air conditioning. Room 2: King bed / Rate: $225 per night/ Max guests: 2 adults. This room is located on the second floor with a westerly view of the Gulf. Room 2 has a private entrance, full bathroom, ceiling fan and central heat/air conditioning. Room 3: Two queen beds / Rate: $225 per night/ Max guests: 2 adults. This room is located on the second floor with Gulf front and westerly views. Room 3 has a private entrance, full bathroom, ceiling fan and central heat/air conditioning. Room 4: King bed/ Rate: $240 per night/ Max guests: 2 adults. This room has easterly and Gulf front views. This spacious room has a private entrance, full bathroom with double vanity, jacuzzi tub and separate shower, ceiling fan and central heat/air conditioning. Click below for availability of Inn Rooms and reservations.